Cinema Paradiso - 4:00 p.m.
E.T. the Extra-Terrestrial - 1:00 p.m.
King of Hearts - 4:00 p.m.
Harold and Maude - 7:00 p.m.
Cinema Paradiso - 12:30 p.m.
E.T. 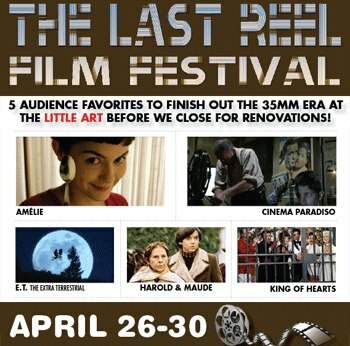 the Extra-Terrestrial - 3:30 p.m.
King of Hearts - 6:30 p.m.
Harold and Maude - 9:00 p.m.
Cinema Paradiso - 7:00 p.m.